Earle Backen was awarded the NSW Travelling Art Scholarship in 1954 to study in London at the Slade and Central Schools. In 1956, while in Paris studying at Le Grande Chaumiére, a chance meeting with friends studying at Stanley William Hayter's print studio Atélier 17 led Backen to enroll himself for the next three years; this was to be an important influence on both his aesthetic development and the course of his career. The broad international influence of S W Hayter (1901-88) has been widely acknowledged in recent years, particularly in England, France, the USA and Japan where the influence was strongest. Backen returned to Sydney in 1959. He was a founding member of the Sydney Printmakers group and three of his colour etchings were included in the Gallery's touring Australian Print Survey of 1963-64. In 1964 he began teaching at the National Art School (East Sydney Technical College) where he set up etching classes and later at the Alexander Mackie College, Sydney. He retired from teaching in 1987 and stopped making prints in the late 1970s, concentrating on painting in oil and watercolour. Backen's earliest prints were made while at Atélier 17. The skills and imagery he brought with him upon returning to Australia in 1959 were to have a significant influence, not only on the evolution of his own work, but also on Sydney printmaking and etching in particular, a fact that remains under-appreciated in accounts of the period. His dissemination of Hayter's influential methods was twofold; firstly, through his role as teacher and secondly through his activities with the Sydney Printmakers. 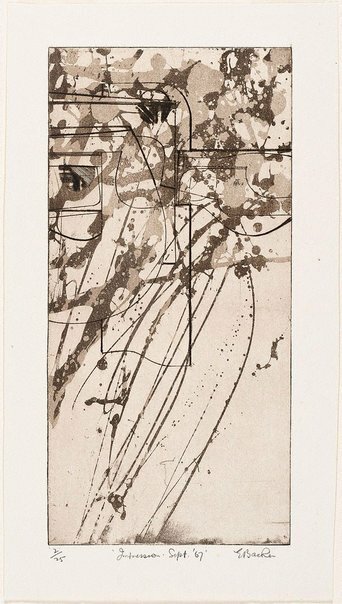 His extended exposure to Hayter's methods, including surrealist notions on the role of the unconscious in making images, are clearly evident in Backen's prints. His gestural, expressive mark-making is closely aligned with twentieth century developments in painting, particularly abstract expressionism. However, his work is also highly structured, with the arrangement of shapes and objects in space revealing a classical sensibility which has remained consistent in his work. Draughtsmanship, central to Backen's work from the beginning, reflects his broader concerns relating to structure and form - the placement of forms within an image, and their relationship within the composition is evident in his earliest prints. Backen's prints began to change as early as 1961, incorporating precise geometric shapes and multiple plates and by the early 1970s he regularly included figurative elements, including those produced by photo-etching and photo-release methods. His later work continued to combine diverse images and textures, maximising the tonal and textural possibilities of the medium, and were generally printed with strong colour. Backen's grounding in the progressive 'new gravure', a particularly twentieth century departure in the appreciation and production of etching and engraving, meant he was one of the earliest artists in Sydney to work with the medium, rather than in spite of it. Signed l.r., pencil "E Backen". Dated lower c., pencil "... Sept. '67'".